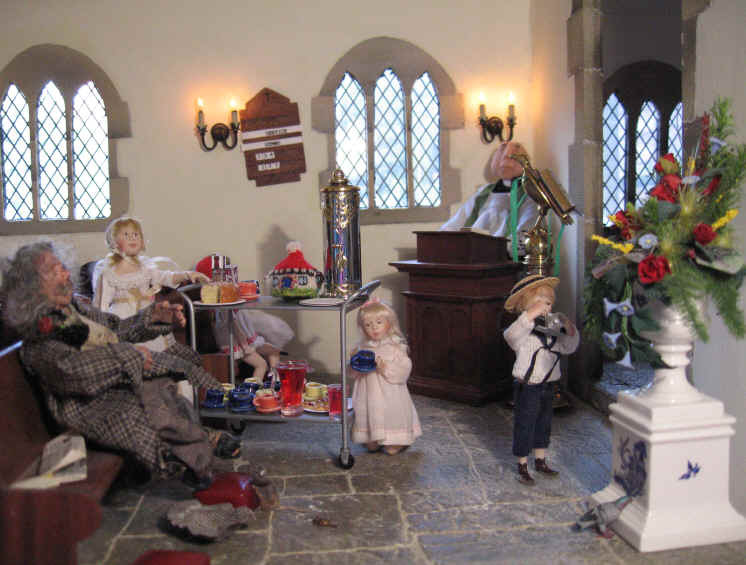 The Reverend Gyles Ponsenby-Smyth is delighted with the new church extension. 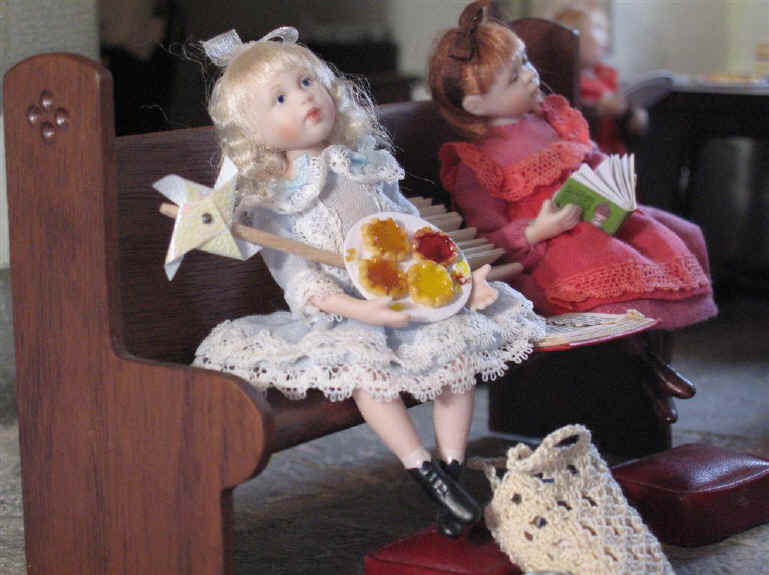 The children just love to sing and dance so the vicar has decided that the church MUST have its own new pipe organ! The coffee morning appeal for the extension was SO successful he decided that they would have another event to raise money and so he has arranged for them to have a coffee and cakes afternoon. The vicar has created a new bill board poster to advertise this new appeal to raise funds for a new organ. 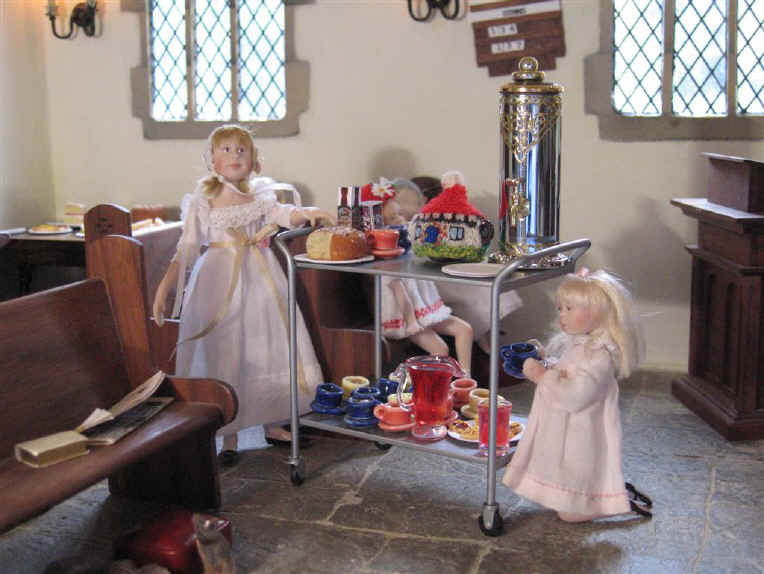 He stands at the door to greet the first visitors to the coffee afternoon..
Alice just loves pushing their tea trolley around the church with the urn, teapot, cups and saucers and cakes! She SO loved it none of the other children were allowed to touch it! She had lots of practice when they had their coffee morning to raise funds for their new extension! 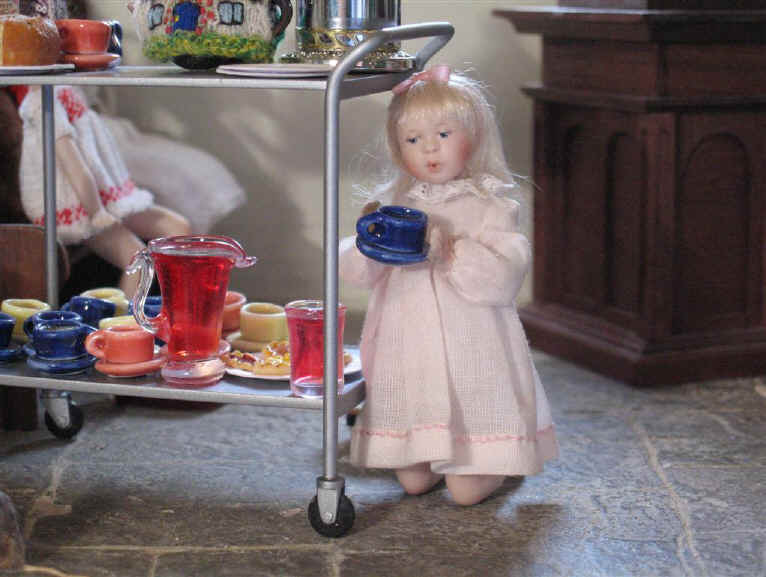 Priscilla Jane is being SO careful with thus cup of tea. She doesn't want to spill it because it will make a mess on her dress. Emily loves jam tarts. She enjoyed them when they held the coffee morning appeal so she grabbed another plate of them today! Oh dear - look at the mess she is making! She never learns does she? 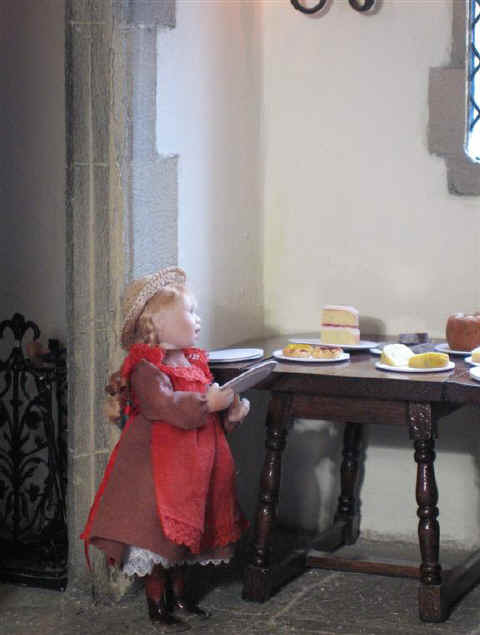 This young lady, Adele, is always first to come up to the table with the cakes on! What cake WILL she choose? Tom has brought his camera today to record the event for the church records. 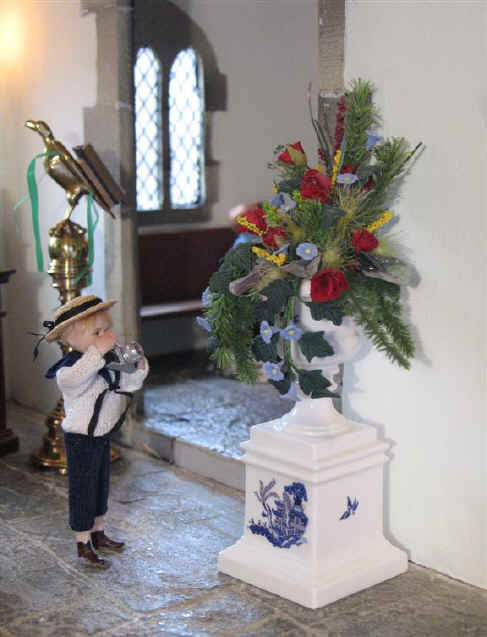 He is seen here taking a photo of the porcelain pedestal with a beautiful flower arrangement on it. It was especially made for this coffee afternoon by the flower ladies. Ben is enjoying a nice cup of tea as he chats to young Robert Alexander! It is NO surprise to see that Robert Alexander has brought his pet dog, Georgie, and his football with him! 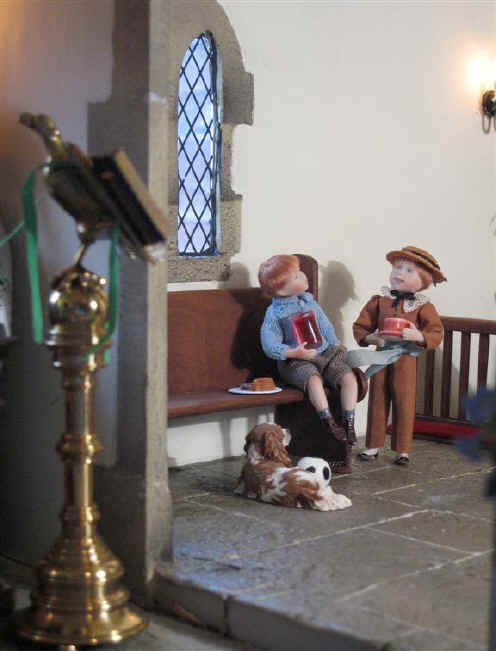 Look how busy everyone is in the church! Even Homer has come in but STILL he has to clutch a bottle of fruit flavoured mineral water in case there is not a drink available that HE likes! The new windows and extension really have made the church look even MORE beautiful. 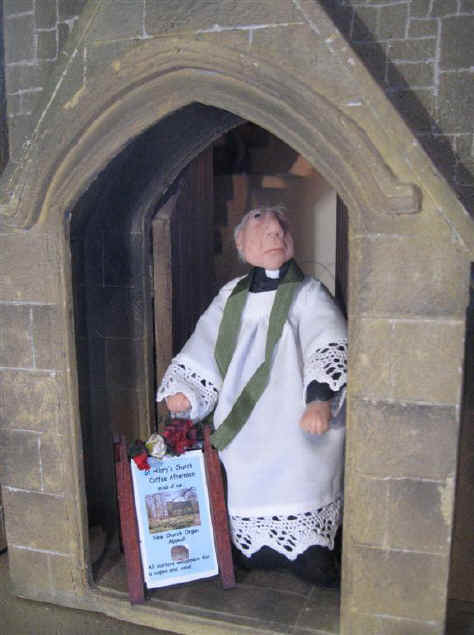 The vicar oversees everyone with his ever benevolent eye.